Either make your own pizza dough, or buy some ready made from an Italian deli – make sure it is really good quality if you aren’t making your own. Come up with your own favorite toppings, or use this version – it was a real hit at our good friend Karli’s wedding stagette! I think the wood fire oven made all the difference, but not everybody has one of those in their back yard. We have had great pizzas just off our grill too – so try it! Of course, you could buy BBQ sauce too – but I just like making it so I have included that recipe. Heat oil in heavy saucepan and saute onions until soft. Add the rest of the ingredients and bring to a boil – allow to simmer until it has reduced and is nice and thick. Taste to adjust for seasoning. Sometimes just a bit of salt and pepper is all you need – but taste, taste, taste! Get it just the way you like it. Grill chicken breasts over indirect heat, basting with bbq sauce until cooked through, and juices run clear – allow to cool, then shred. Return to grill or oven and cook just until cheese is bubbling and crust is golden and crunchy. This entry was posted in Appetizers, Chicken, Grillng, Italian, One Dish Wonders, Recipes and tagged barbecue sauce, Chicken, grilling, onions, pizza, wood fire by Chatty Kathy. Bookmark the permalink. Those pizzas look fabulous! What a treat! They were delicious! 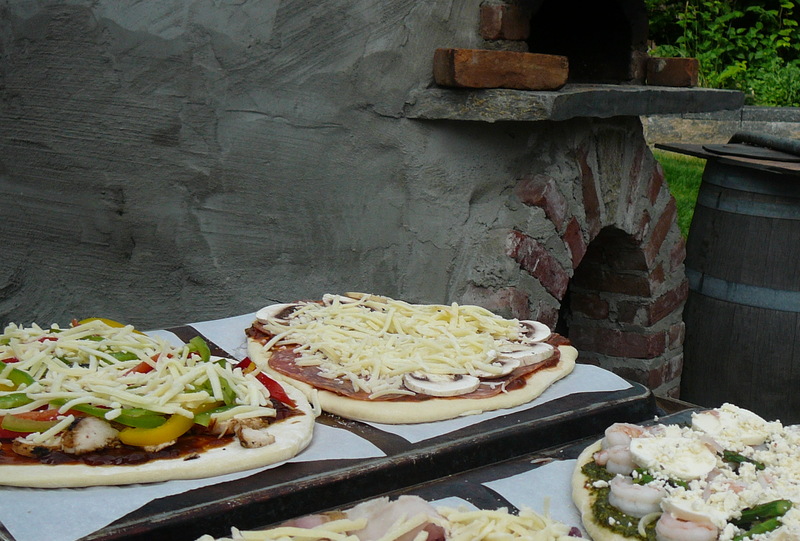 Don’t worry if you don’t have a wood fire oven though – we also love them on the grill.